Live coverage from around Maryland, with news, notes and analysis the day after voters participated in the state's primary election. Baltimore voters selectd candidates for mayor, while voters around Maryland selected candidates for president, senate and congress, among others. 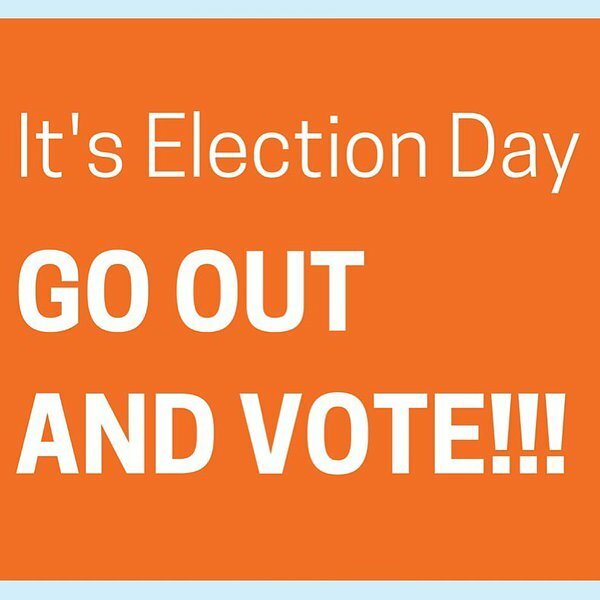 Find Maryland election results on the pages below. 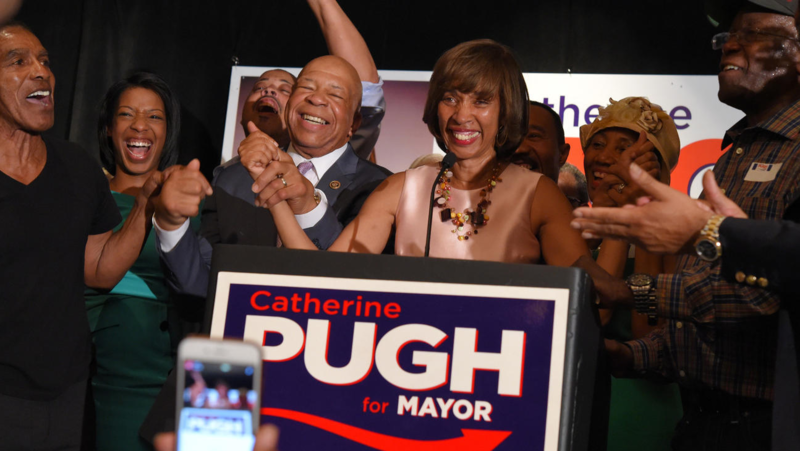 Sen. Catherine Pugh celebrates her primary victory in the race for mayor. Ohio Gov. John Kasich says his pact Ted Cruz to collaborate on strategy against Donald Trump is a matter of resource allocation, and nothing more. Speaking to NBC's “Today” Tuesday, as voters prepared to vote in five Northeastern states, Kasich insisted that his partnership with Cruz is not indication that he is giving up on his campaign. Crowd lining the block, waiting for jobs from Pugh campaign. Official word on popular "I Voted" stickers in #Baltimore . City election board didn't pack them for 296 precincts, sending some out now. Other folks tell me they're backing @PughForMayor because Dixon "had her chance"
Ann Wiker has always voted, but this time seemed a bit different to the 47-year-old art lecturer and curator, more “pivotal,” not just nationally but locally, she said just after casting a ballot at Thomas Johnson Elementary School in South Baltimore. So understanding where each candidate planned to take Baltimore City in particular was paramount. And this year, more than any other in memory, the Federal Hill Democrat said it was easier than ever to meet the people vying to lead and hear their ideas. There were forums and speeches and meet-and-greets. Many candidates knocked on doors too. 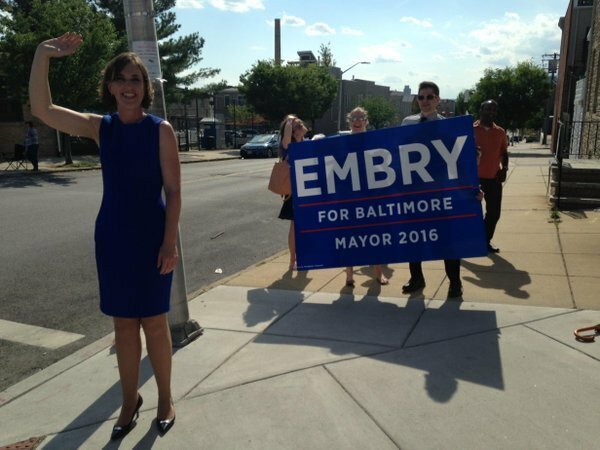 She already knew she would support Eric Costello, the incumbent councilman representing her neighborhood, but she was able to engage with many mayoral candidates before making a decision to back state Sen. Catherine E. Pugh. Maryland, a small state that holds a primary later in the political season, doesn’t usually have much of a say in the presidential election. And while front runners have emerged, the decision has not been made yet this year for either party – and Eileen Wold believes there are still good choices. The 37-year-old artist and professor who lives in Locust Point said she initially couldn’t decide among three Democratic candidates. Ken Weaver stood with a stop watch at Francis Scott Key Elementary/Middle School Tuesday morning checking to see how long it took voters to cast their votes. Weaver, an election day observer, was keeping track of wait times at voter precincts as part of a project with the University of Baltimore Schaefer Center for Public Policy for the Maryland State Board of Elections. He kept his eye on a man in a plaid shirt and a lady behind him in a peach-colored top, marking the time it took until they scanned their ballots. 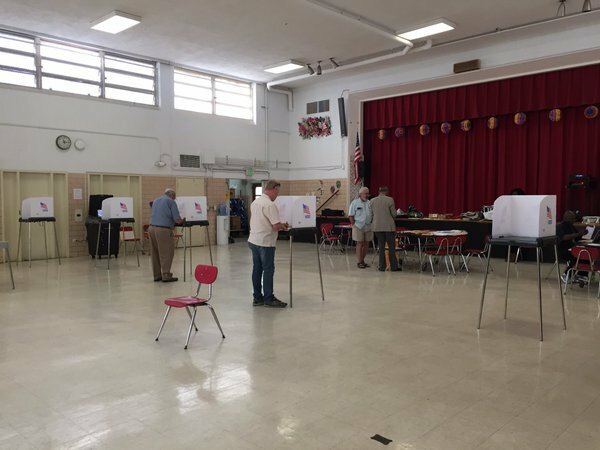 “Ten minutes max, which is pretty great,” he said outside one of the city’s busier precincts. But Weaver said lines tend to be longer first thing in the morning — before people go to work — and then at the end of the day — when they get off. “It will be much busier tonight,” he said. Weaver expected a decent turnout given the many challengers in the mayor’s race, and the presidential and congressional races. He said he has been impressed with the mayoral candidates who have been very engaged. He said he’s seen many out speaking to voters during early voting events. “I’ve seen [mayoral candidate David] Warnock everywhere,” he said. 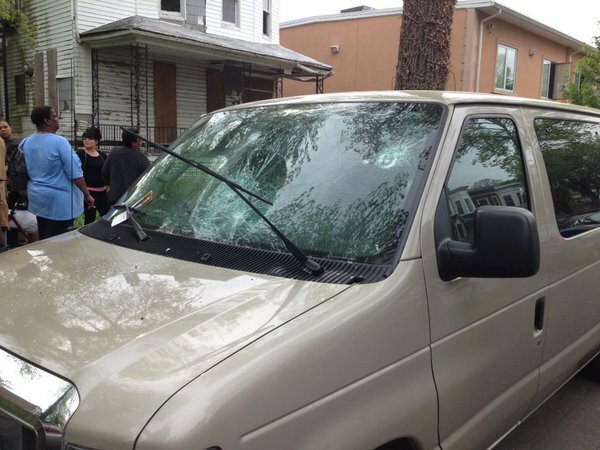 He planned to head out to several other locations in the city and Baltimore County. 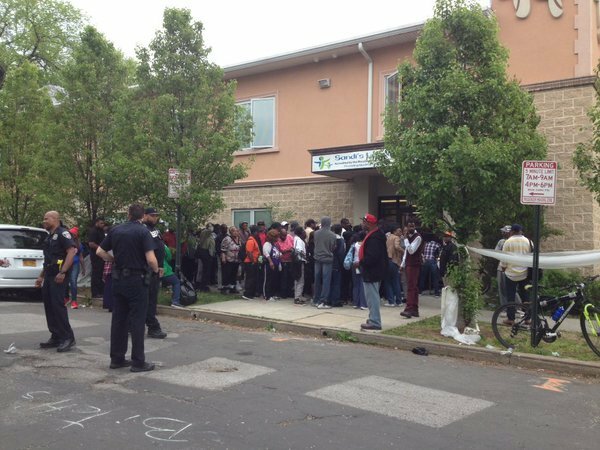 “As long as the polling place is well-staffed,” he said he predicted a smooth day. At the Roland Park Elementary/Middle School in North Baltimore, poll workers said turnout was steady. Several voters said they wanted their votes to make a point, even if they weren’t confident in a win. In the presidential election, Bernie Sanders’ emphasis on income inequality and the disappearance of the middle class resonated, said Scott Norris, 62, a self-employed consultant. If there's anyplace in Maryland that confirms the adage that all politics are local, it's the Morrell Park neighborhood of Southwest Baltimore. Voters here are taking a lively, though distant, view of the presidential race and the contest for the U.S. Senate. They're vitally interested in the mayor's contest. But the battle that's truly stirring passions in this integrated, working-class bastion is the one for the City Council seat held by Ed Reisinger for two decades. Reisinger, who lives in this neighborhood, is seeking re-election over three opponents in the Democratic primary. He had both passionate supporters and ardent detractors. 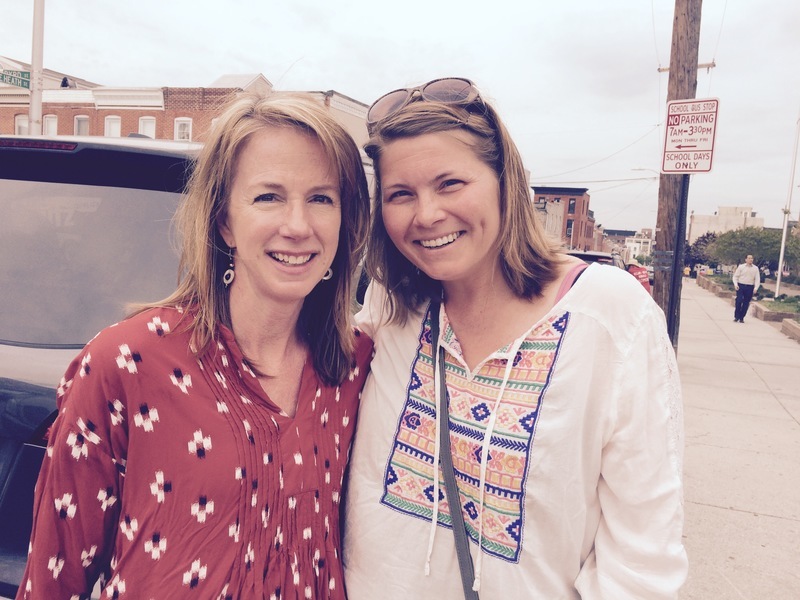 Wendy Roberts, 46, credits Reisinger with leading the community in its successful fight to block a CSX cargo transfer facility nearby. "He goes above and beyond his means," said Roberts, who runs a cleaning service. But maintenance worker Robert Adams was backing challenger Charlie Metz, saying Reisinger wouldn't help him land a job while lining up work for relatives. 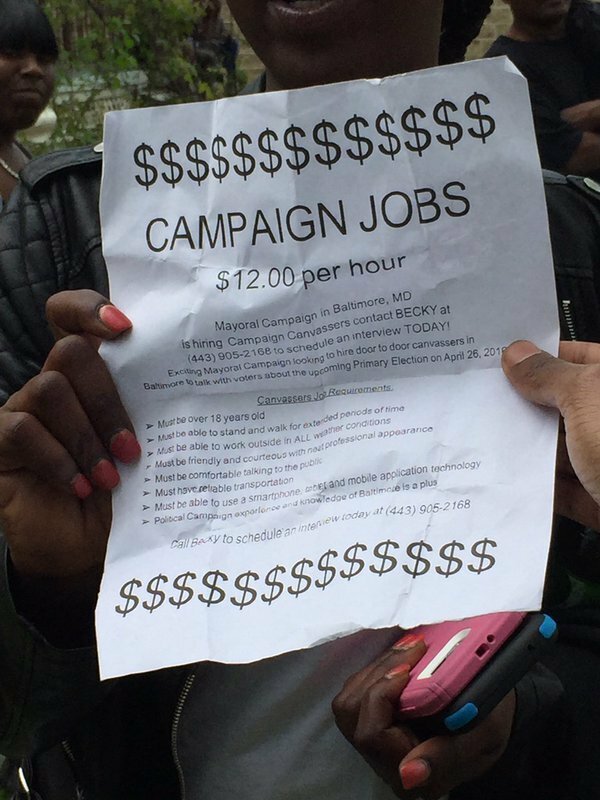 "He did nothing for this neighborhood -- nothing, nothing, nothing," said Adams, 57.
baltimoresun.comBaltimore&rsquo;s election director, said his staff did not include the &ldquo;I Voted&rdquo; stickers in the cabinets sent to the city&rsquo;s 296 precincts, but he has begun to send packs out to polling places and said workers are welcome to pick them up at election headquarters. Steven Phillips, an 18-year-old Towson High School senior, glided along the street on his skateboard to cast his first-ever vote at Stoneleigh Elementary School in Towson. A registered Republican, Phillips cast his ballot for John Kasich. Joan Burger and her husband, Fred, walked to the Stoneleigh Elementary School in Towson to cast their ballots in opposite party primaries. She’s a Republican, he’s a Democrat. But they’re both pragmatists. 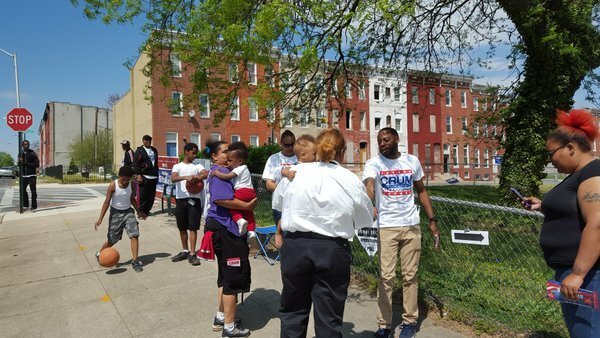 At Hazelwood Elementary and Middle School in Northeast Baltimore, voters were inundated with leaflets from both City Councilman Brandon Scott and his challenger, Tony Christian, as they approached the polls. Scott said the turnout had been steady all day. Scott supporter Monica Brunson, 51, of Cedonia, said she was drawn to the polls by the hotly contested mayor’s race. Brunson said he been supporting Councilman Nick J. Mosby for mayor until he dropped out. She felt former Mayor Sheila Dixon was the second-best choice. She also cast ballots for Former Secretary of State Hillary Clinton and Congresswoman Donna Edwards. “I think it’s important that Barbara Mikulski’s seat be filled by another female,” Brunson said. Mary Logan, 38, also of Cedonia, said she, too, was backing Clinton, but she preferred State Sen. Catherine E. Pugh for mayor. There were no lines to vote and no parking jams at the fire station near Falls and Old Court roads. So John Shafer, a 46-year-old personal trainer from Riderwood, was delighted at how quick and easy it was to vote. As a Baltimore County resident there weren’t many names on the ballot. Raised as a Democrat, he said, he voted for Hillary Clinton. 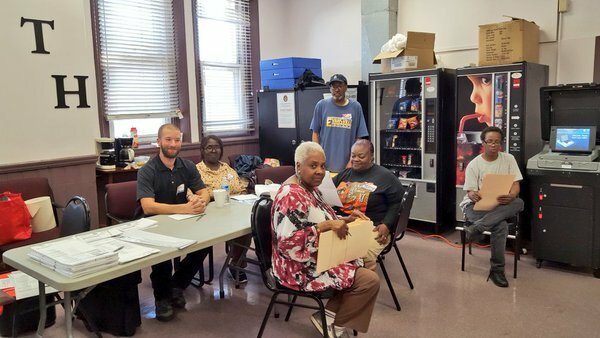 An unexpected surge in voters needing provision ballots at the polling location in the Latrobe Homes in East Baltimore left election officials turning some voters away Tuesday afternoon. 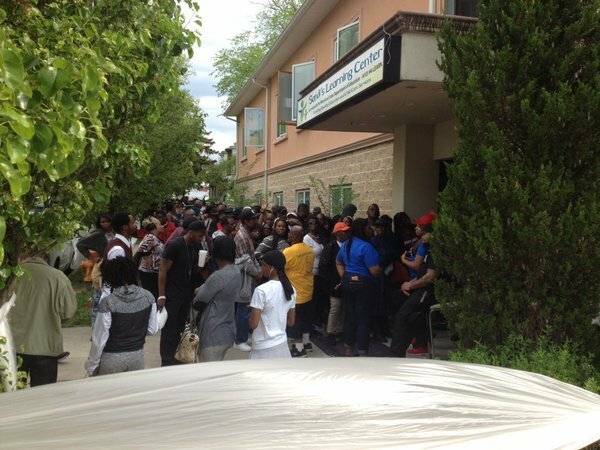 By 3pm almost as many people had voted provisionally as had cast regular ballots – 48 to 54. “Usually I get less than 25,” said Democratic election judge Gregory Neely. He sat at a table in the offices of the low-rise public housing development, helping the voters fill out the last two provisional ballots before he stuffed them in a bright pink sack. Officials had no explanation for the unusually high number of provisional voters, but Neely said he had seen some ex-offenders who might have benefited from a recent change in the law. 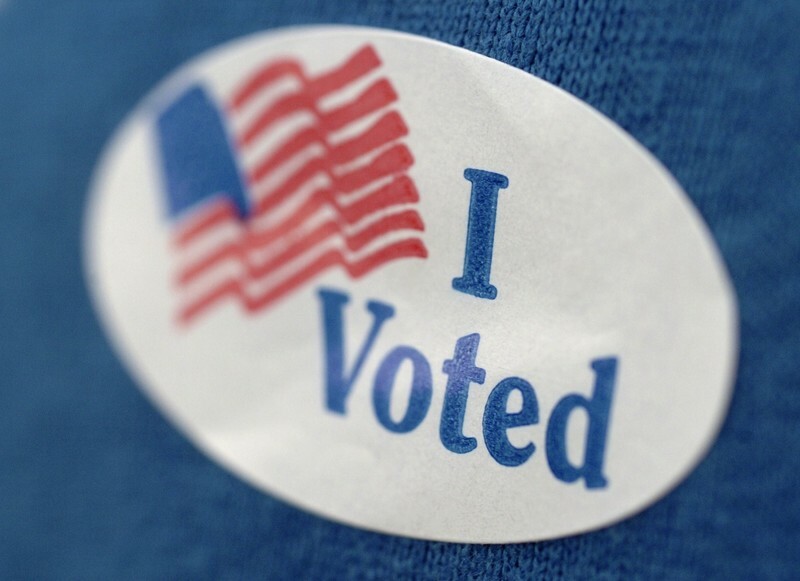 The Maryland Board of Elections says officials usually require voters to cast their ballot provisionally if they show up at the wrong polling place or don’t have identification if they’re a first time voter. When Kemp Ferebee, 52, turned up at the polling place he had already been to one location before being diverted. Officials told the disabled construction worker he’d have to come back later. Others decided to sit and wait. Election judge Pauline Edwards-Shehee worked the phones, trying to track down some more ballot papers. 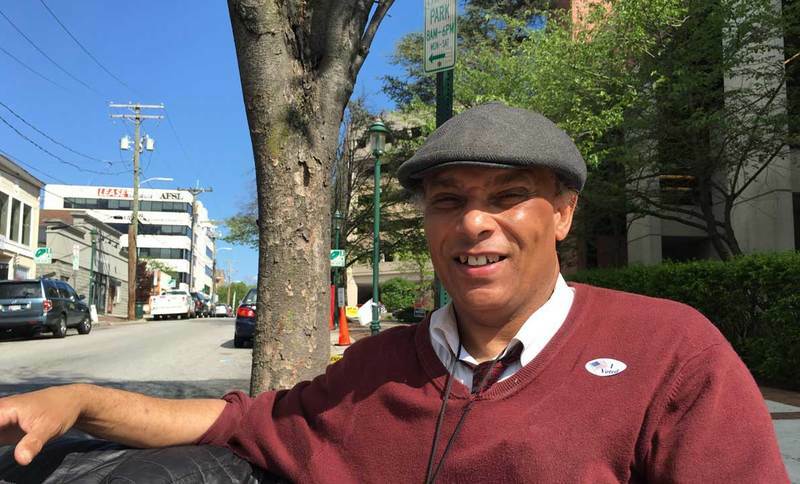 Douglas Brown, 53, who voted at Towson Presbyterian Church, described himself as "a Democratic Party voter for Hillary, to continue Obama's policies." Brown also cast a ballot for U.S. Rep. Chris Van Hollen in the competitive Democratic primary for U.S. Senate. Brown said he was swayed by Van Hollen's support for education, especially fighting for equity for minority children. He also likes that Van Hollen has opposed the National Rifle Association. BREAKING: @DonnaFEdwards is asking a Baltimore Circuit Court to keep city precincts open until 10 p.m. because some opened late today. "The plaintiffs are threatened with irreparable injury...since many voters will lose their right to vote," according to the complaint.